NAMM 2018: If you’re looking for a gateway synth into the world of Eurorack, Radikal Technologies thinks it has it in the form of the Delta Cep A. 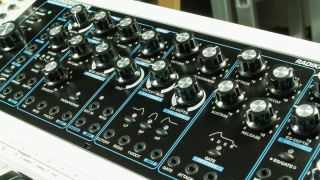 This semi-modular paraphonic instrument can also be used as a standalone instrument, and features a MIDI to CV interface, oscillators, filters, an LFO, an envelope generator, a mixer, VCA and an FX section. Each section has the requisite inputs and outputs, enabling you to use it as part of a wider modular setup. Feature highlights include the Swarm oscillator, which enables you to tune a bank of up to eight oscillators into chords, clusters or one fat detuned multi-oscillator; an analogue filter and a digital multimode filter; and the Interpolator. This stores synth patch memories and enables you to recall them sequentially and crossfade between them. Find out more on the Radikal Technologies website. The Delta Cep A will be shown for the first time at the NAMM Show. The price is still to be confirmed.